I think I speak for the entire internet when I say, my edges are officially SNATCHED and have retired to the land of baby hair and afros! I’m not a member of the Beehive. I turned in my credentials years ago, but as an artist and creator, I’ve continued to enjoy watching as Bey expands our imaginations and pushes the envelope. I can admit that, what Beyonce stands for – from a public perspective – I don’t. I’m not a supporter of the “single ladies” movement, the man bashing movement or the feminist movement. I do, however, recognize greatness, talent and discipline. I tend to keep my ear to the ground when it comes to what’s stirring up black women in America; so I also recognize when America’s black sweetheart, goes rouge! Based on her most recent, overt cries of “I am Black” and “I will not take the oppression of my people lying down”, I had to see what “Lemonade” was hitting for. My oh MY was it a hit! All that said, I think that by and large, the message was missed. It’s too easy to say that Bey made an entire album to out her man for his cheating ways. No, no, no! (Kendrick voice) That’d be too obvious! Then to bring it to a close with Jay-Z lovingly caressing her over sentimental family video footage? I’m not buying it. Look a little deeper, and you’ll see what is probably the greatest power move ANY power couple has ever made unfolding before our eyes. Let’s take it back to Kanye’s VMAs outburst…follow me here. I’m Beyonce, the metaphoric “bride” of the mainstream music industry. Tonight, the night when my “groom” acknowledges me before the world…he gives my props to “Becky with the good hair”. GASP! I’m still Beyonce, my branded image is squeaky clean, so where I would like to run through the streets with “hot sauce in my bag” smashing all the windows in valet parking, I keep my cool. I hold my peace when I must pinch, cinch, bleach and belittle to get the same accolades and endorsements “Becky with the good hair” gets for just being herself. ..and yet, it’s not enough. Becky wins again. The backlash after her Superbowl performance let the world know that in the eyes of America, Beyonce, and black women, can be anything we want to be, except unapologetically black. No, not that! She yelled the war cry for all the beautiful sisters who came before and who are to come. Our grandmothers who had to wear the dresses of the misses but the shame of the mistress. Our mothers who wore the skin and scalp of the mainstream image of beauty…and still weren’t “perfect” enough… Now we, still stuck under these curses, learning daily how to break free from the images and BE the natural standard of beauty that we’ve always been. I gathered this from the visuals she gave us after the whole “let me wear her skin” piece. She showed up and showed out in bleached white skin with bleach blond tresses. Bey gave us history, presence and shed light on how to move forward into the future. TOGETHER. Several times in “Lemonade” she called upon her grandmothers, and other grandmothers for answers. It was heart warming to see New Orleans’ own Leah Chase being honored with a cameo. She is an elder of great wisdom and much cherished here in our city. What stood out to me the most during the spoken parts of Lemonade was not the seeming “calling out” of “low down” men, it was the pain. The deep, ancestral pain that screamed WHY?! Why did you go through this hurt grandmama? Mama? Me? What did we do to contribute to the pain and how can we stop these pains from recurring? Beyond the pain we’ve shared with black men, what about the pain we’ve endured from other men? She filled us up with images of black love and family. Black men dancing in the streets and smiling. Unity. Community and closing the breach – together. Did you catch it? She defined the power of a bomba$$ WIFE! “Lemonade” was a Tidal exclusive. Prince’s music? Tidal exclusive. Kanye’s latest release? Tidal exclusive. Jay-Z and Beyonce have essentially raised two middle fingers to the “industry” and said “what you won’t give us, we will MAKE”. That message is resounding throughout America and the diaspora at large right now…and it’s POWERFUL. 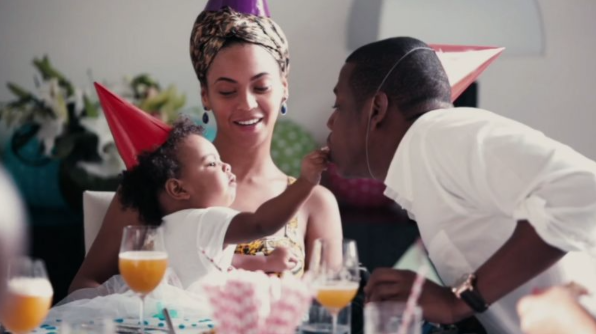 It’s even more powerful that in the midst of the mainstream tearing the business side of Jay-Z’s new music-streaming service apart, Bey is leveraging her star power to keep her husband’s business relevant, and remind us all why black power families are necessary. What messages did you get from Beyonce’s visual album “Lemonade”? Very Cool. I love it, but I think I need to watch it a few more times to digest it. Good stuff. I too have to watch it again to catch all the missed lessons. it was such a smorgasborg of powerful imagery. Thanks for your write up! YES! It was definitely sensory overload. Thank you for reading!! Thank you for taking the time to read sis! !